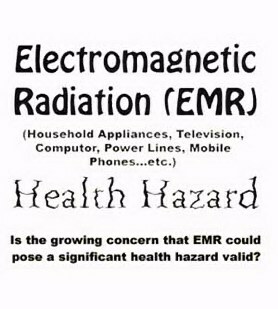 Electromagnetic Radiation (EMR) is from Reflection magazine. Issue No.11 November/December 1998 ISSN 1326-8414. Electromagnetic radiation is the complete range of wavelengths generated by the oscillation of electric charges. Everything from cell phones, mobile phones, cellular phones, and a pocket radio to power lines and everything in-between emits EMR. You cannot see it but you can feel it. Put the back of your forearm next to a TV screen or a computer monitor and feel the hairs on your arm move. The field of the TV or computer monitor's EMR induced an electrical field in the biological tissue of the hair on your arm. But is EMR a health hazard? Worldwide reports on scientific studies regarding EMR continue to reach us. Government bodies, major industrial corporations and scientific researchers spend billions of dollars in search for conclusive evidence as to exactly what EMR does to the health of humanity. While the investigations continue the public's fear of power lines and microwave towers near schools and homes continues to grow. The increasing number of cellular phone users joins computer operators in their concern over EMR cancer scares. Why the growing concern? From Japan we hear that it is generally accepted that microwave ovens are harmful to humans. Manufactures of microwave ovens take measures to protect the users from the health hazards of leaking microwaves. Mobile phones use microwaves. From the United States we hear that researchers in Seattle discovered DNA damage in the brains of rats that had been exposed to radiation. Elsewhere rats were found to loose the ability to acquire simple tasks when exposed to a mere 45 minutes of microwave radiation. In Australia the National Radiological Protection Board studied the effects of mobile phone electromagnetic signals. Almost half of all the mice exposed to the signals developed cancer after just one and a half years. In England thirty-three percent of scientists on one project stopped using their cell phones after their experiments with cellular phone signals. In July 1998 scientists at England's Defense Establishment Research Agency were working on a slice of a rat's brain. The slice was from the short-term-memory portion of the brain. The scientists stimulated the cells to make them function and then proceeded to broadcast radio signals. 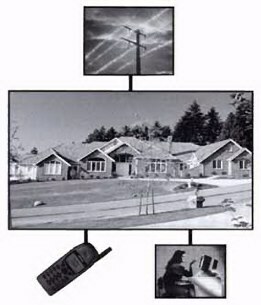 The signals they used were at a lower level than is currently considered safe in cell phones. Within minutes their equipment showed readings that indicated the equivalent response of sudden memory loss and confusion in a living rat. The readings returned to normal once the signal was switched off. The project director, Dr. Rick Hold said, "This is the first real evidence that these sort of radio waves do have an effect on the brain. We cannot say whether, at this stage, this is dangerous or not - but clearly we need to find out pretty quickly." The English scientists advised using caution when making the leap between experimental effects on rodents and what the same effects would be on humans. In 1997 medicine reporter Lila Lazarus tells us that Doctor Thomas Bauld, a biomedical engineer at U of M, made a similar statement. He said, "You have a whole issue in the differences in metabolism of the animal, differences in the blood circulation levels in different parts of their body or the fur or the other type of things that could impact whether or not you can transfer this. It's not an easy thing to do." Nonetheless we continue to see disturbing reports. We read about new research suggesting that signals disrupt parts of the brain in charge of memory and learning. Cellular phones reportedly are causing a rise in blood pressure, may harm pregnant women, cause brain tumors, cancer, headaches and tiredness. Scientist Dr. Roger Coghill has been quoted as saying, "Anyone who uses a mobile phone for more than 20 minutes at a time needs to have their head examined." He went on to say that during June and July this year no less than five separate laboratories had produced evidence that cell phones were hazardous when used to excess. The jury is most assuredly still out. Regardless of the inconclusive evidence to hand, many researchers recommend employing precautionary measures. Use the three most commonly accepted precautions: time, distance and shielding. Time - decrease the amount of time you spend near the source and you decrease the amount of exposure. Limit the time you spend talking on a cellular phone and be sure to change the cell phone from ear to ear at regular intervals. Distance - the farther away from the source the less exposure. Use one of the many handsfree attachments available for mobile phones. Shielding - increase the shielding and decrease the exposure. There are a number of products on the market that claim to shield your body from cellular phone radiation. One such item is Purple Plates.